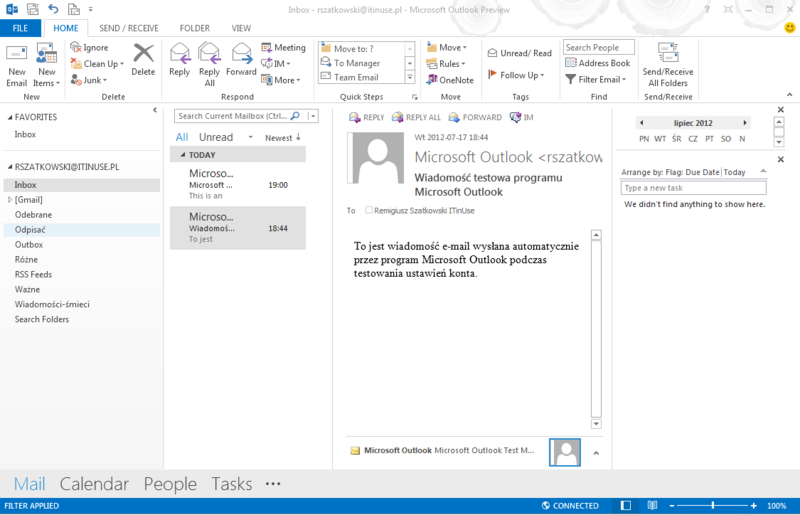 With the release of Microsoft Office 2013 Preview obtain the new version of Microsoft Outlook. The new version is designed to communicate with all what it will go, Outlook allows us to connect with your Facebook, LinkedIn, My Sites, without the installation of additional plugins. Microsoft Outlook 2013 can be installed on Windows 7 and Windows 8 Preview. The first change that I can see when you start Microsoft Outlook 2013 is to change the colors. The preview version of the application splash screen is blue (like Lync), not orange. 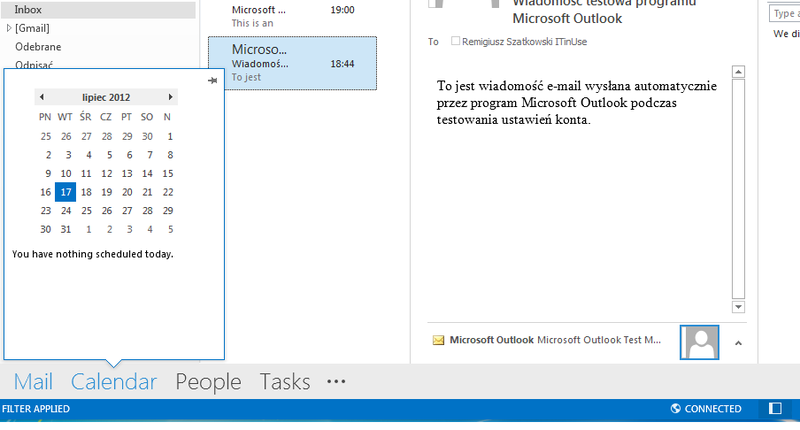 On the left navigation bar is visible to the email, the old buttons that are shortcuts to the calendar, contacts, tasks etc are placed at the bottom of the application window as text. Contacts have been replaced by the label people. When you move the mouse cursor to a given label (Mail, Calendar, People, Task), we can create any item associated with this label. This allows to create a new appointment do not have to go to the calendar, you need only click on any label Calendar. 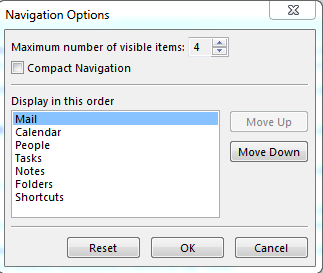 To the right of the Outlook window, add strips Calendar (Calendar), Tasks (Tasks) and Contacts (People), we have to go to the View icon and select To-Do Bar where you can specify what is to be displayed in the right side. The main window displays a list of messages provides you quick access to categorize messages, delete them. If we have a preview on the news, we can respond to email directly from the preview window without the appearance of an additional window with the message. The People section has been introduced the possibility of linking contacts (connection), if we have two contacts of a person, the one we have recorded personal data and the second data service, then we can combine the two contacts in the one containing the combined data. In the calendar, but there is information from weather forecasts, display weather can change in the calendar options in the longer, where we can determine if the weather strip to be displayed and in which degrees (Celsius or Fahrenheit). Location for which you want to display the weather forecast, we set the bar projections in the calendar. Contacts view (People) have also been changed. In the new version we have the opportunity to combine information from social networking sites, add photo contacts, information on availability, combining information from multiple contacts in one contact. 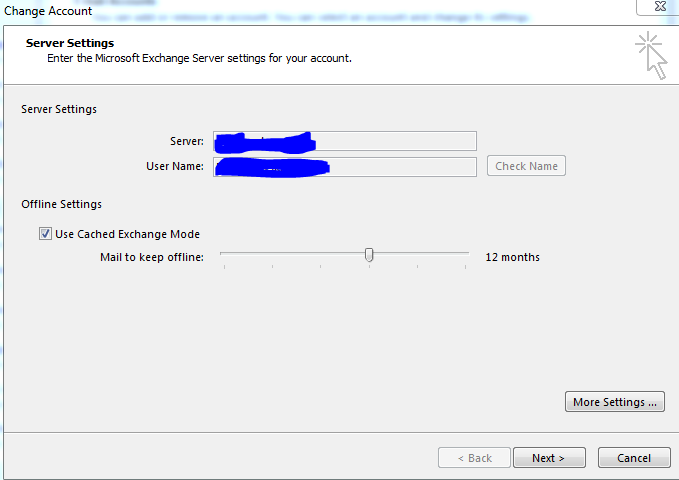 A very interesting option is a cache of Outlook, or work in cached mode. This allows us to reduce the size of the file. Also, the boxes are supported for example on which we get Gmail using IMAP also can configure the number of messages that appear in the ost/pst file. Tagged Microsoft Office 2013 Preview, Microsoft Outlook 2013, Outlook. Bookmark the permalink.